This 12” wide machine is possibly the fastest 110v 12” laminator in existence. While producing a superb finish and edge seal it is capable of speeds up to 17 fpm and can laminate 3 mil material in excess of 10 fpm. It can use films from 1 to 15 mils thick and will laminate materials, such as foam board to 1/4” thick. With a set up time of a couple of minutes and a thru-put capability in excess of 1000 fph extremely profitable productivity can be expected. 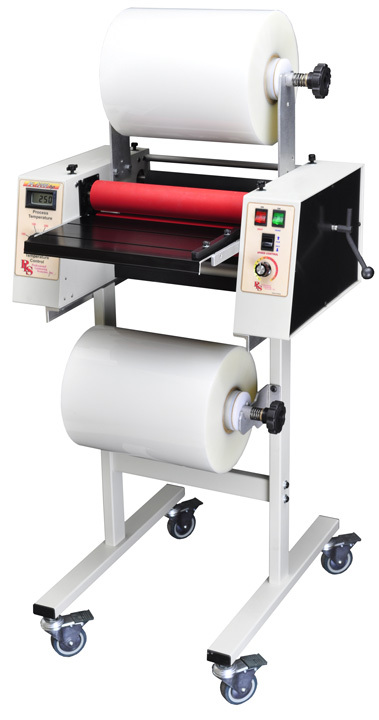 The PL 1200 is simply a 12" wide high performance commercial laminating machine. This machine fills the gap between "toys" and expensive commercial laminators, while sacrificing nothing in quality and performance. This is truly a professional machine in every aspect. And remember, simply turn it on when you need--warm up time is about four minutes on this little guy. Also remember that the vast majority of all printing, copying, and duplicating machinery does not process output that exceeds 12” in one dimension and the vast majority of laminating films sold are less than 12” in width as well. Actually, the only thing little about the PL-1200 is its price.